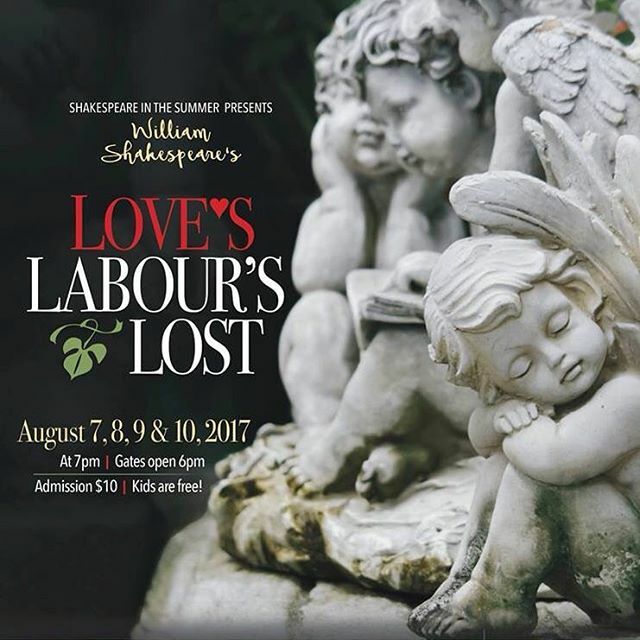 ABINGTON ART CENTER, PULLEY & BUTTONHOLE THEATRE COMPANY, and WHITE PINES PRODUCTIONS announce the return of Shakespeare in the Summer with an Original Practices Production of Love’s Labour’s Lost to be presented August 7, 8, 9 & 10 2017 on the lawn of Alverthorpe Manor at the Abington Art Center. The three arts organizations are excited to once again bring an affordable opportunity for audiences of all ages to experience the beauty of Shakespeare’s language in the beauty of the great outdoors. Shakespeare in the Summer works within the Original Practices style of presenting Shakespeare, meant to simulate the way Shakespeare’s own company prepared his plays, and to rediscover a spontaneity, joy, and immediacy in performance. The show is cast, scripts distributed, and lines are learned without rehearsal. The actors will gather weekly to play games, study the play, learn techniques, and create an ensemble. As Benjamin Lloyd, Executive Director of White Pines says, “we are attempting to imitate the way Shakespeare’s actors prepared his plays for performance. It can be scary at first, but brings an unmatched spontaneity to performances.” Every performance is a new experience for the audience and the ensemble.